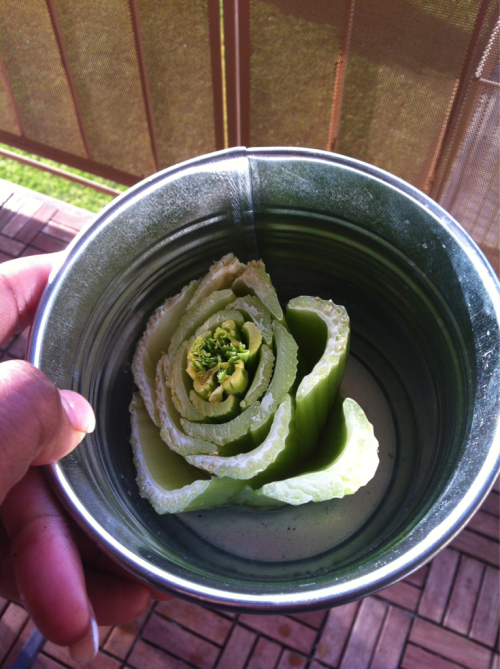 Re-Grow Your Own Celery!! - 30 Bananas a Day! To regrow celery from store bought celery, keep the end of the stock (the part you don’t eat) and soak it in water for a few days. When leaves appear from the center and grow about an inch or two in height, plant in soil covering the stock (not the leaves). When matured, cut celery just above the dirt line then cover the remaining stock with a layer of soil and water. Grow, repeat and enjoy! Thanks for posting this, I'm starting tomorrow! Dr Graham mentions this in his blog or book, but not such precise instructions; I did not realise he means the whole thing regrows. Must get increasingly toward organic over time too. Great info! I eat loads of celery, easily 2 heads/day. I put some bases in water this morning; - one has grown 2 shoots 1.5cm, within an hour! Thanks. I never knew. Just found out about pineapple a few months ago. And Erik- That's pretty funny, and awesome. Celery just doesn't quit. Glad you guys liked this, thanks! I thought it was really cool when I came across the idea, as soon as I get through my current bunch of celery I'm definitely going for it. Of all the stuff I threw into my compost pile, the celery trimmings grew themselves into a new plant. ps- not my photo, found it online.